We’re exploring new ways that dogs can help people. Using Animal Assisted Intervention (AAI) we can help people facing real challenges experience the benefits of dogs in a therapeutic and meaningful way. Dementia Dog is a collaboration project between Dogs for Good and Alzheimer Scotland and explores how trained dogs can help people to live well with dementia. Dementia Dog Project – Channel 4 film from Dogs for Good on Vimeo. 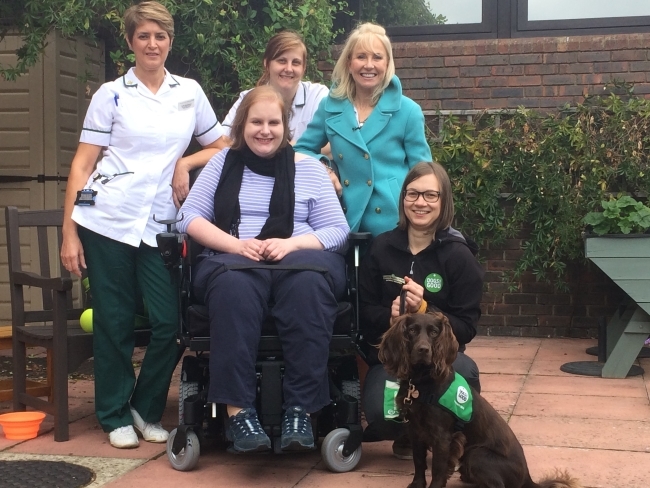 We’ve joined forces with Buckinghamshire Healthcare NHS Trust for a pilot project which will see how specially trained dogs can help patients at the National Spinal Injuries Centre (NSIC) at Stoke Mandeville Hospital in their recovery. Read more about this project. Pilots are being conducted in collaboration with the Child Brain Injury Trust (CBIT) to explore how dogs could help children with acquired brain injury overcome their difficulties. A staff member from Dogs for Good has been working with a representative from CBIT and the family to set up a plan of sessions working towards specified goals or objectives for the child with acquired brain injury. The short pilots that have taken place so far have provided us with opportunities to develop case studies and gather evidence of the benefits of the service in action. We’ve teamed up with Age UK Oxfordshire to trial a Walking and Wellbeing group in Bloxham to encourage older people to come out in the community, exercise, and socialise. This has been targeted to people with or without dogs. Their dogs were assessed and carefully monitored by Dogs for Good staff who also brought some of the community dogs or dogs in training along to allow people without dogs to have some hands on doggy experiences. To supplement walks we also organised club meetings with a dog theme. We are looking to evaluate the trial to understand the benefits and how such services are received by participants. We’re keen to talk to prospective partners who share our values and are interested in exploring the potential of Animal Assisted Intervention to help the people they support. If you’d like to discuss potential opportunities with us, please tell us a bit more about your organisation, the people you support and your ideas, by completing this enquiry form. Please note that the day to day operational costs of our Community Dog service are met by our partners and this forms part of our developing social enterprise activities.